Lately, I've been on a James Daugherty kick. I just love his illustrations. Last summer, I saw A Child's First Book of American History in a local store that carried a few homeschool products, and I really, really wanted to buy it. The illustrations were simply gorgeous, and I thought it looked like a perfect book to read to my son. I loved that it was a book of stories about important people in American history. Isaac enjoys books like that. It wasn't inexpensive, though, so even though it was beautiful, I convinced myself to leave it in the store. When I got home, I started looking through the books I already had, and lo and behold, I was the proud owner of The Rainbow Book of American History by Earl Schenck Miers, which is the original version of the book I saw in the store! I was thrilled! I noticed that Mr. Daugherty had done the illustrations, and decided to go see what else I might have by him. I found several things and am collecting more as I find them. Isn't that striking? I thought these posters were an interesting facet of James Daugherty's art career. 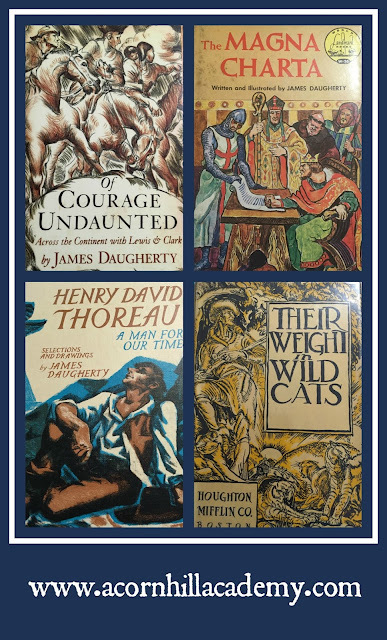 He wrote picture books, such as Andy and the Lion; biographies, like the Thoreau and Lewis & Clark biographies pictured above; history books, such as The Magna Charta (part of the Landmark series of which we homeschoolers are so fond), and illustrated some compliations, such as Their Weight in Wild Cats, which is a book of American "tall tales." Many of his books are out of print, but many are still available. I find them sometimes at library sales and in thrift shops, too. 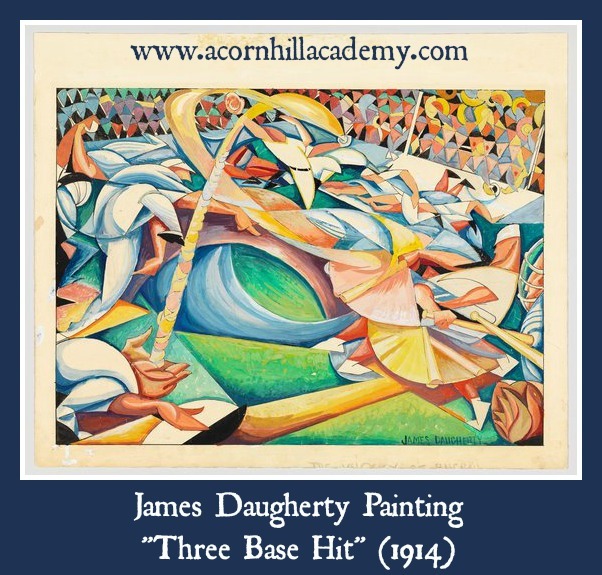 I really like James Daugherty's illustrations, and I'm looking forward to learning more about his other art, too. I hope you've enjoyed this small sample of his work. I did enjoy this look at James Daugherty's work. I'd never seen, or maybe never noticed, it before. May have to stop and do some more looking!